Holz Bass Drum Skin Os Kick Head Mic Port Hole Protector: 4"/5"/6"
5 Stool Sticks Black & Size Full Complete Cymbals Drum Adult Set Kit with Piece. 7ply 7.5mm Bass Drum Shells 7ply 6.15mm Tom & Snare Shells. Satin Black Maple Burl. With standard drum depths, the unique Maple and Walnut shell composition coupled with the SONIClear™ bearing edge results in clear and focused rack toms, fat and dense floor toms, and bass drums with a balance of punch and boom. Pork Pie Maple Drumset with Macassar Ebony veneer. Drum Sizes: 8x10 Rack Tom, 9x12 Rack Tom, 12x14 floor tom, 14x16 Floor Tom, 18x22 Bass Drum. The Macassar Ebony veneer rounds out the set with the perfect balance of visual style and audio performance.". 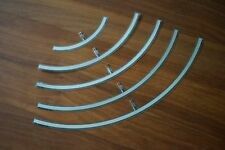 7ply 7.5mm Bass Drum Shells 7ply 6.15mm Tom & Snare Shells. Deep Water Maple Burl. With standard drum depths, the unique Maple and Walnut shell composition coupled with the SONIClear™ bearing edge results in clear and focused rack toms, fat and dense floor toms, and bass drums with a balance of punch and boom. With the AQ2 Series drums you can sound like the pros. Featuring all-maple shells and Sonor’s new SmartMount – German engineering at a lower price-point. AQ2 Safari Set includes 6 x 13 Snare Drum. With the AQ2 Series of drums, you can sound like the pros. All maple shells and our new SmartMount facilitate this. German engineering inside. Series AQ2. 1 x Snare Drum 14" x 6". 1 x Bass Drum 22" x 17.5" WM. Has 8x10 and 9x12 rack toms, 14x16 floor, 5x14 snare, and 18x22 kick. Even though these are considered "beginner" line kits they're made like tanks! 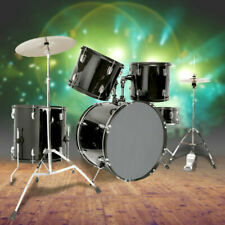 We specialize in anything drum related from the early 1900's to the 1980's. Cherry Mist Maple Burl. 7ply 7.5mm Bass Drum Shells 7ply 6.15mm Tom & Snare Shells. With standard drum depths, the unique Maple and Walnut shell composition coupled with the SONIClear™ bearing edge results in clear and focused rack toms, fat and dense floor toms, and bass drums with a balance of punch and boom. 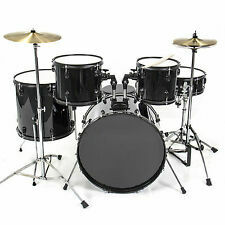 Here is a Noble & Cooley Horizon Drum Set Kit. Drum sizes are 9x13 Tom, 16x16 Floor Tom and 14x22 Bass Drum. Drums only stand not included. These Hendrix Perfect ply drums are made 4 plies of walnut, resulting in a 5mm thick shell. Walnut is known for the punchy, boosted low end it provides. Every detail has been looked over and perfected to assist in the pursuit of resonance, such as the single point milled aluminum lugs, and also the maximum resonance 90 degree bend floor tom legs with floating feet. Just released from Ludwig is their limited run of Classic Maple Aged Exotic kits, of which this is the Exotic Tamo Ash finish! These kits are astoundingly rich with burl, inside and out. Ludwig introduces a limited release of exquisite aged exotic veneers available in our Classic Maple series. Beautiful diamond electronic kit in gun metal grey and black silk hardware. Snare 14x4.5 - Tom 12x7" - Floor toms on legs are short stack 14 and 16 x 8" - Bass is on a riser with Sonor style legs at 18x10" with matching wooden hoops. All hand made. This beautiful kit looks even better in person and sounds amazing. Don't let this deal pass you by! Satin Black Maple Burl. 7ply 7.5mm Bass Drum Shells 7ply 6.15mm Tom & Snare Shells. With standard drum depths, the unique Maple and Walnut shell composition coupled with the SONIClear™ bearing edge results in clear and focused rack toms, fat and dense floor toms, and bass drums with a balance of punch and boom. 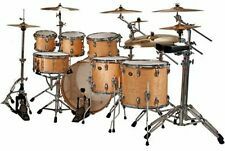 Mapex Armory 6-Piece Studioease Shell Pack Drums (Desert Dune) BEST PRICE! Included Armory Tomahawk Snare Drum. Desert Dune. The SONIClear™ tom suspension and floor tom feet increase overall resonance by preserving vibration in the shell and keeping stress away from the tension rods, helping the heads stay in tune. Featuring 6-ply Maple Shells, the tone is powerful and warm with balanced mid and high frequencies. Exclusive Gretsch Retroluxe Badges were also specially cast for this kit. Deluxe features on this release include a special Gretsch 130th Anniversary rare two-toned black/gold lacquer finish that Gretsch also used on their 130th Anniversary guitars. MASTRO SNARE DRUMS AUSTRALIA. MASTRO SNARE DRUMS. SNARE DRUM 14"X6". GREEN ACRYLIC DRUM KIT. 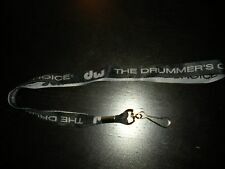 WILL GET A SET OF SOFT DRUM COVER INCLUDING IN THE PRICE. DRUM SIZE 10"x8" 12"x9" 13"x13". BASS DRUM 20"X16". Made from 100% Maple shells, AQ2 drums have a wonderfully versatile tone that can fit into almost any style of music. Round that off with Sonor’s legacy of quality, and you’ll soon see why AQ2 drums are a force to be reckoned with. This handmade in the US kit is perfect for any style of music. The steambent curly maple sounds massive, powerful, yet resonant and toneful at any dynamic level. Don't let this deal pass you by! Color: "Ultramarine". Included Armory Tomahawk Snare Drum. Two Booms, Snare Stand, Hi-Hat stand and Single Pedal. Black Plated. SONIClear™ Tom Suspension. 6Ply 7.2mm Shells. Birch/Maple/Birch Shells. With the AQ2 Series of drums, you can sound like the pros. All maple shells and our new SmartMount facilitate this. German engineering inside. Series AQ2. Series: AQ2 Safari Series. 1 x Snare Drum 13" x 6". Matching Snare Drum. The SONIClear™ tom suspension and floor tom feet increase overall resonance by preserving vibration in the shell and keeping stress away from the tension rods, helping the heads stay in tune. 13" Crash Cymbal. 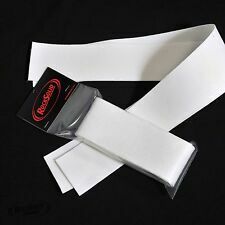 1 Ply Coated Snare Drum Head. 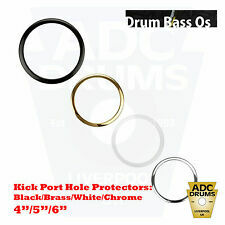 Clear Bass Drum Heads w/ Self-Muffling Rings. Smooth White Tom Heads. Two Durable Covered Finishes. 6-ply Poplar Shells. Because of its sound characteristics - balanced in low, mid and high - the Birch drum sound is very popular for studio recordings as well as live performances. When developing SQ1, Sonor tested several combinations of Birch-based shell materials. 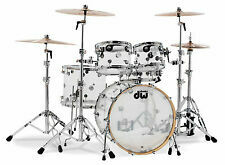 The DW Frequent Flyer drum set is a result of a collaborative effort from the great Peter Erskine and DW Drums. The Design Series utilizes the DW HVLT (Horizontal/Vertical Low Timbre) shells which are currently being used with the Collectors cherry shells. Pork Pie Maple Drumset with Quartered Mahogany veneer. Drum Sizes: 9x13 Rack Tom, 16x16 Floor Tom, 14x22 Bass Drum. The Quartered Mahogany veneer is finished with an oil finish which accentuates the rich grain patterns while also allowing the drums to resonate at their maximum potential. Catalina Club is the smartest selection you'll make when searching for a paired down kit used for tight spaced rehearsal rooms of if you're carrying them around town from club to club. Authorized Gretsch Dealer. Pork Pie Maple Drumset with Quartered Mahogany veneer. Drum Sizes: 8x12 Rack Tom, 14x14 Floor Tom, 14x20 Bass Drum. The Quartered Mahogany veneer is finished with an oil finish which accentuates the rich grain patterns while also allowing the drums to resonate at their maximum potential. This kits include Gibraltar Hardware. Part of our Gretsch Drum Clearance! Prices will not be reapted! GRETSCH NEW CLASSIC. Drum Heads: Toms Batter - Remo Clear Emperor, Resonant - Remo Clear Ambassador. We have carefully recreated the look and feel of the 1950's teardrop lug and updated it with SONOR's exclusive Tunesafe™ system. 9 Ply Beech Shells with 6mm Shell Thickness. Shell construction features SONOR's unique CLTF and OSM process. With the AQ2 Series drums you can sound like the pros. All maple shells and our new SmartMount facilitate this. German engineering inside. Sonor Config Setup: AQ2 BOP. Series AQ2. Cymbals and hardware not included. GRETSCH USA CUSTOM 6 PCE DRUM KIT IN RED DUCO. The good news?. There's still a few left. Finish Red Duco Nitrocellulose Gloss Lacquer. Type 6 Pce Drum Kits. 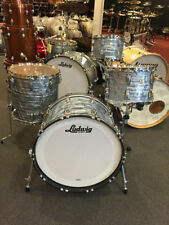 Part of our Gretsch Drum Clearance! 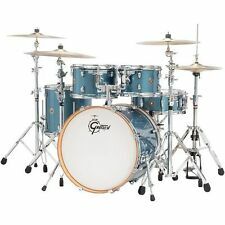 New Gretsch Renown 4-Piece Drum Set RN2-E604-SOP. 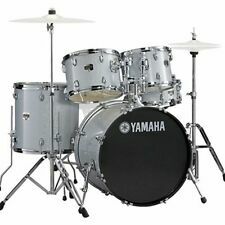 Now, with one drum set, you can play with the sensitivity and touch to handle the smoothest grooves of the 1950s; the attack and projection required to drive the most powerful compositions of the 60s and 70s; and the clarity and vibrance needed to faithfully reproduce the clean studio sounds of the 80s, 90s and beyond. 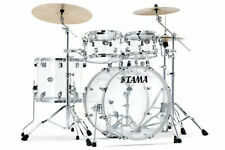 KAT Percussion KT3 - Advanced, High Performance Digital Drum Set. The built-in general MIDI sound card includes a variety of play-along songs that are both fun and challenging to play. 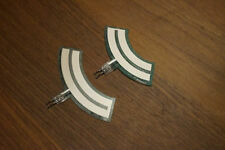 A pair of 1/4" stereo output jacks accommodate direct recording and mixer amplification. 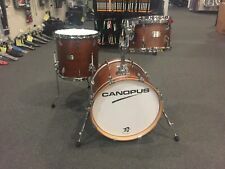 Mapex Dealer with Full Warranty. The SONIClear™ tom suspension and floor tom feet increase overall resonance by preserving vibration in the shell and keeping stress away from the tension rods, helping the heads stay in tune. Featuring 6-ply Maple Shells, the tone is powerful and warm with balanced mid and high frequencies. Exclusive Gretsch Retroluxe Badges were also specially cast for this kit. Cymbals are shown for illustration purposes only.